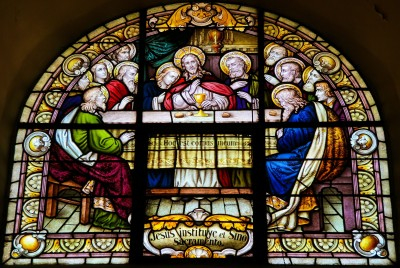 The “last supper” was instituted by Jesus Christ to His 12 disciples in the upper room of a house in Jerusalem. Jesus was very intentional about the time that He wanted to do this because it had to be done close to His crucifixion. It is important to note that this was a very climactic moment in time. Jesus was juggling two different scenarios in that upper room. One scenario was the symbolism of the bread and the cup as His own flesh and blood. The other was a scenario of betrayal. Let us dive into scripture and find truth. “And he took bread, and when He had given thanks, He broke it and gave it to them, saying, ‘This is my body, which is given for you. Do this in remembrance of me.’ And likewise the cup after they had eaten, saying, ‘This cup that is poured out for you is the new covenant in my blood. But behold, the hand of him who betrays me is with me on the table. For the Son of Man goes as it has been determined, but woe to that man by whom he is betrayed.’” (Luke 22:19-23) Jesus gave His disciples something tangible that they could do to always remember His death and redeeming blood for all sin. The verb “do” means to keep doing. That is why we celebrate communion in church. I wonder just how real the bread and wine were to the disciples on that day at Golgotha when Christ was crucified. Did they think about the bread when the hammers drove nails into Jesus’ hands and feet? Did they think about the wine as Christ’s blood flowed out of Him? The main idea that Jesus wanted to get across was that all believers NEED to NEVER FORGET the importance of the crucifixion. He already knew that the church would institute communion later and He gave all of us a great way to remember His selfless, loving act to redeem us. Please don’t take communion unless you are serious about telling Jesus “thank you”. There will never be a moment in history that comes close to Jesus’ crucifixion. Oh the love that was expressed at Calvary! It was a perfect love that defeated death! Satan lost that day! Praise Jesus! The love of Jesus is absolutely amazing! He picked Judas Iscariot to be one of the twelve disciples, even though He knew how Judas would betray Him. Judas bought the death of our Savior for 30 pieces of silver (Matt 26:15). Jesus’ love is a perfect love because He gives even the worst of sinners a chance to choose Him. Jesus really does portray the perfect model here. He does not confront Judas, but instead allows him to finish his reprehensible deed. Jesus was already forgiving Judas before Judas left the upper room. I honestly think that this was a lesson on forgiveness to all of us. If Jesus can forgive the man who was going to be responsible for His death, then it is important that we all examine our own lives and see if there is some forgiveness that needs to happen. This goes hand in hand perfectly with communion. Matthew 5:23-24 says, “So if you are offering your gift at the altar and there remember that your brother has something against you, leave your gift there before the altar and go. First be reconciled to your brother, and then come and offer your gift.” The message is very clear here. Our praise and thanksgiving is a gift that we give our Lord and Savior, Jesus Christ. If we harbor any unforgiveness in our heart then our gift means nothing. We must first forgive and then partake in communion. Then only will our gift be well received by our Lord. 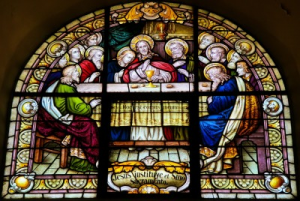 So, the passage on the Last Supper shows us a great model on how to observe and remember Christ’s ultimate act of love for us. The passage on the betrayal shows us a wonderful example of forgiveness, which leads us back to taking communion properly. It is a whole lesson in itself. I have chosen a song by a band called Theocracy called “30 pieces of Silver”. It is a perfect song to showcase here; you can view it in the upper right of this page. If you don’t like this style of music, I encourage you to look up the lyrics online. It talks about how treasure fades away and nothing compares to our Savior. It warns all of us to not put anything ahead of Christ. Christ is worth everything we have! He gave it all and He deserves our all! God bless you as you live out a life worthy of the calling. I think this is the most dramatic part of the bible. Perfect example of giving forgiveness and mercy – even if Judas would betray him, Jesus still chose him as one of his disciple. Praise God. Amen Marlon. Jesus Christ is abounding in love and mercy! Thank you for your compliment Jean-Marc 🙂 Blessings on you and your family. Thank you Derek. Yes, it is a great model indeed for us on how to take communion. Just think of what must have been going thru Christ’s mind at the time just overwhelms me on a human level, but Jesus had the end in mind in order to endure the coming horror of Calvary. Thank you my brother. I get overwhelmed too Jack. Christ is omniscient and He knew how many lashes He would receive, how many times the nails would be driven into His flesh and how long He would hang in agony on the cross before finally giving up His spirit. All the while, accepting Judas as a disciple even though Judas would betray Him. There will never be a love expressed with this kind of intensity ever again! Blessings on you brother! What a great comparison you gave concerning Jesus forgiving Judas, that man who betrayed Him. How right you are that, if Jesus forgave Judas, he is able to forgive me. God bless you, brother. Amen Robert! We have an awesome Savior in Jesus! God bless you brother. My Brothers in Christ, I will never give up on this my only Savior. he is everything to me. Amen. May God bless you all. I love you all. Amen brother! Christ is everything!! God bless you too brother! Next post: What Is Scientology? What Do They Believe? Are They Christian?